A new layer type, VectorTileLayer, accesses cached tiles of data and renders it in vector format. It is similar to a WebTiledLayer in the context of caching; however, a WebTiledLayer renders as a series of images, not vector data. VectorTileLayers contain geometry, attribute, and style data in individual layers. Styles can be customized client-side. To get better familiarized with the properties, methods, and events of this layer, please see the VectorTileLayer API reference for additional information. Beginning with version 3.15, both esri/geometry/geometryEngine and esri/geometry/geometryEngineAsync objects are no longer considered beta. These modules each provide more than 30 methods for measuring, overlaying, and testing spatial relationships between geometries in web applications. They include functions such as buffer, intersect, and offset for calculating proximity, spatial relationships, and measurements of area and length all client-side. No network requests are made when using any GeometryEngine functions. This means that using GeometryEngine in favor of GeometryService can significantly enhance the user experience in web applications, particularly in editing applications or when working with a large number of geometries. The following blog posts explain some of the benefits of using GeometryEngine and include samples using GeometryEngine for various purposes, including testing spatial relationships while editing, measuring, and overlay. 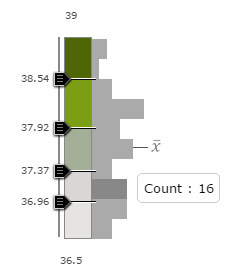 The createPredominanceRenderer() method was added to the smartMapping module allowing you to generate a UniqueValueRenderer showing the predominant value in each feature among a set of two or more competing fields. 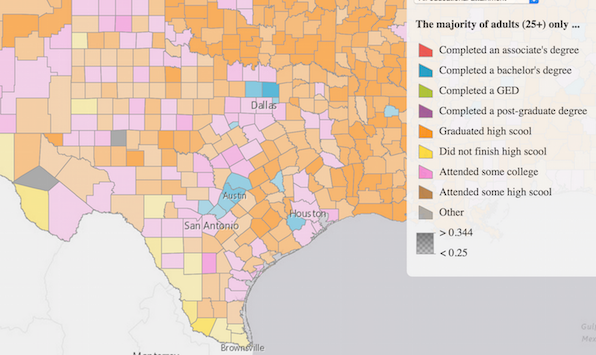 For example, in the sample below the map depicts the predominant educational attainment of adults in each U.S. county. Blue features indicate that more adults in the county earned a bachelor's degree than the number of adults in any other educational attainment level. Counties shaded with orange indicate more adults finished high school and didn't continue on to college than the number of adults in any other educational attainment level. Opacity may optionally be used to show the strength of the predominant variable. 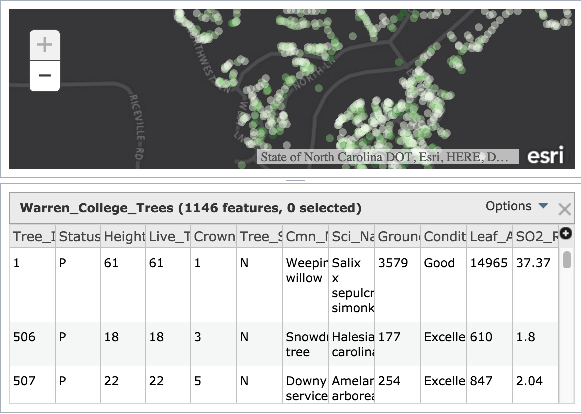 Version 3.15 introduced the ArcGIS Symbol Playground. This sample provides a place to explore symbol capabilities of the API. Here you can try out new features, customize them, and copy the generated code into your own application. It also provides a starting point so as to allow use of these features as quickly as possible. The sample works with symbols such as: SimpleMarkerSymbol, SimpleLineSymbol, SimpleFillSymbol, CartographicLineSymbol, PictureMarkerSymbol, PictureFillSymbol, and TextSymbol. The playground displays the symbol in addition to providing an easy-to-use UI for modifying properties. Once modified, the symbol updates appropriately while updating the sample snippet displaying how it appears in code. Visit the documentation for each renderer class regarding details and code samples for each symbol type. 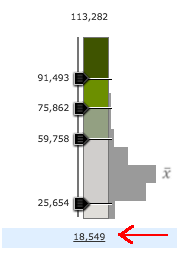 Hovering over an individual bar will darken the grey and display a tooltip. Added CSS classes to aid in styling histogram SVG elements. Holding the Ctrl/Cmd key while moving the top or bottom slider enables the opposite slider to move an equal distance away or toward the center handle. A gradient map displays for attribute level transparency. 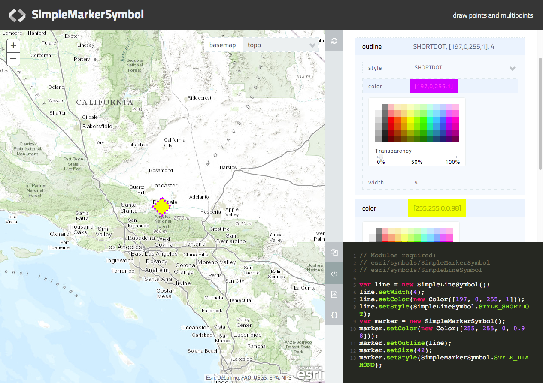 The CSS class name .container used by Map was renamed to .esriMapContainer to avoid CSS conflicts with other frameworks. The .layersDiv class was also renamed to .esriMapLayers. Renaming these classes is a breaking change for apps that use them for customized CSS. These changes to the class names won't affect the majority of applications, which don't alter CSS properties in these classes. useCors supports "with-credentials" as a new option. corsEnabledServers can now contain objects with host and withCredentials properties. Additional information about these updates can be found in the Default API configurations topic. BUG-000089569: Fixed an issue where legend categories were reversed when zooming in map. BUG-000089658: ImageServiceMeasureTool measurement results are now localized to Japanese properly. BUG-000088231: Fixed an issue when using map.setExtent's fit option did not work as expected. BUG-000084635: Added an additional source property, locationToAddressTemplate. This provides a template string used to customize the value for a returned geocoded address. This property was introduced due to an issue where coordinates were displayed instead of addresses after reverse geocoding. BUG-000090285: Adding a suffix parameter to search sources is fixed and now locates correctly. BUG-000086648: Fixed LayerSwipe sample to size correctly. BUG-000089015: Fixed an issue where changing the meaurement dijit unit would cause the measure-end event to fire. BUG-000087915: Fixed an issue where multiple requests were sent when using the Legend widget. BUG-000087337: Fixed an issue where domain values were not displayed correctly when using the FeatureTable widget if the outFields property was set to all fields. 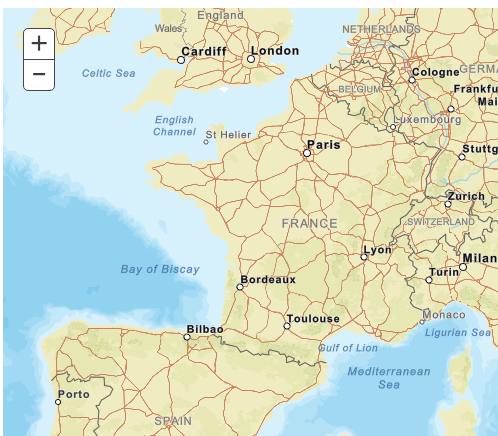 BUG-000087176: Fixed an issue where the BasemapGallery's basemaps' titles did not match up correctly when using a French locale. BUG-000087973: Fixed an issue where the minValue/maxValue in ClassedColorSlider and ClassedSizeSlider would not update. BUG-000084024: Fixed an issue where editing very large numbers would raise "Out of range" errors. BUG-000087534: Fixed the Mobile Web Map sample where the map would Map is cut off on when you rotated the device and opened the "Map Options" panel. BUG-000091559: Fixed an issue where zooming caused a Chrome browser memory leak. BUG-000090585: Fixed an issue in the Measurement Widget where the widget was automatically open by default. ENH-000089709: Updated the Renderer documentation to be clearer regarding how sizeInfo works. ENH-000089350: Updated SDK documentation for the draw-end event to state that it is deprecated. Instead, use draw-complete event. ENH-000088462: Updated SDK documentation with additional information on how the ArcGISTileMapServiceLayer constructor option, resampling, works. ENH-000090106: Added the ability to set the Search widget's zoomScale property directly on the source. ENH-000088309: Added support for TextSymbol halo. ENH-000088642: FeatureTable now works with a FeatureLayer created from a feature collection. ENH-000088499: Now possible to reshape polyline features using simple straight line. ENH-000089631: LayerList widget now displays WMSLayer layer names instead of numeric values. ENH-000089716: Updated SDK documentation to include information for the ImageServiceMeasure.measureToolbar property. ENH-000089718: Updated SDK documentation to include information for RasterLayer pixelFilter property and setPixelFilter() method. ENH-000089313: Updated documentation in install files addressing how to work with multiple non-standard ports in a single local API install. Be certain to check out any updates to the repository on GitHub with TypeScript definitions for the JS API as well as the jshint options file used by the JS API team.